Thank you Stonyfield Organics and King Arthur Flour for sponsoring today’s recipe! As always, all opinions are my own. Looking to feed a crowd? 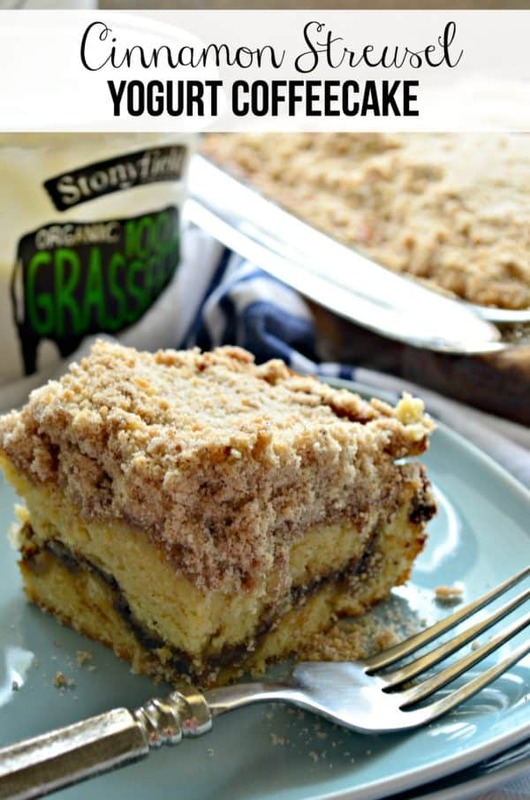 Make this recipe for Cinnamon Streusel Yogurt Coffeecake–your family and friends will be impressed by this easy to make cake! Holy smokes. I’ve been eating and testing coffeecake recipes for what feels like years–okay maybe it really has been years since I’ve been eating coffeecake since I was a little girl! I’ve been in search of the perfect, moist and flavorful coffeecake for probably the last 5 years. 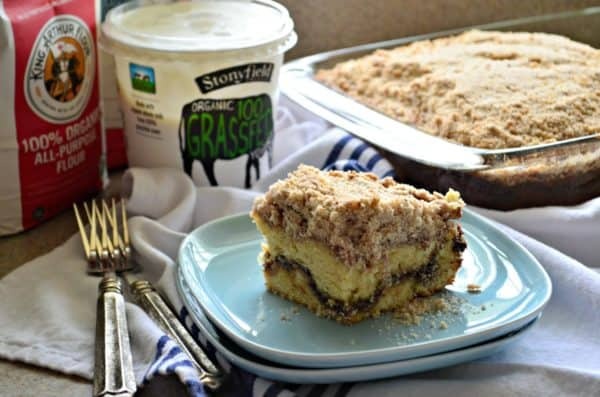 I’ve tested countless recipes… and then I came across this recipe for Cinnamon Streusel Yogurt Coffeecake from King Arthur Flour. Hands down–this is the holy grail of coffeecake recipes. I’ve made sour cream coffee cakes in the past but never with yogurt. So when my friends at Stonyfield challenged us to bake something using King Arthur Flour I started brainstorming ideas. And then coffeecake came to mind. Since I’m not a skilled from scratch baker I found this recipe on the King Arthur Flour website and gave it a test run. I’ll be the first to admit that it was a little labor intensive. However, so so worth it in every way! You’ll prep the topping and then the filling followed by the actual cake batter. First up, I used King Arthur Organic All-Purpose Flour for the batter and topping! It’s the only flour I use in my home, so this collaboration was a match made in heaven for me. I used Stonyfield Organic 100% Grassfed Vanilla Yogurt for this recipe. If you’ve never tried the grassfed yogurt it comes from cows who graze naturally on lush grass, and gives yogurt a rich and unique flavor. I find that it’s a little thinner than traditional yogurt and much more creamier. And like all Stonyfield products, 100% Grassfed is organic, non-GMO and made without the use of artificial hormones. I can find the grassfed yogurt at my local Whole Foods and The Fresh Market. Check the product locator on the Stonyfield page to find out where you can buy Stonyfield Organic 100% Grassfed Yogurt. So if your like me and love coffeecake. Look no further–try no other recipes. Your search for the best coffeecake recipe is right here. 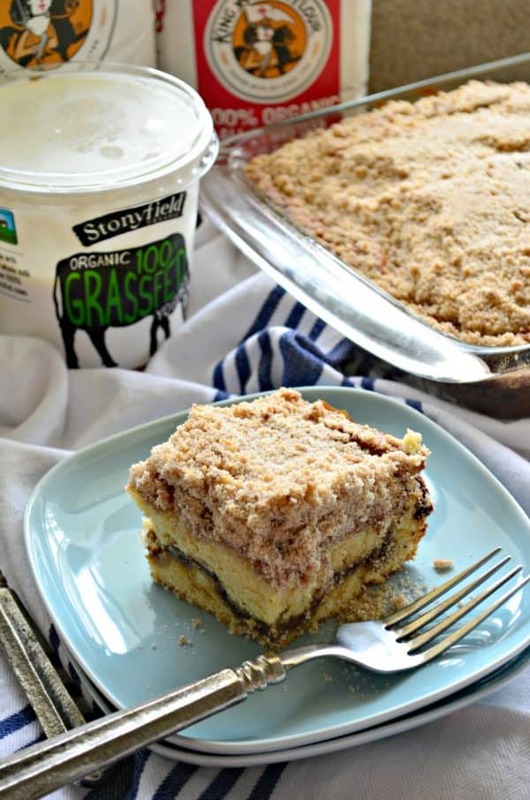 Gather all the supplies and make this recipe for Cinnamon Streusel Yogurt Coffeecake! Preheat the oven to 350°F. Lightly grease a 9 x 13 pan. Make the topping by whisking together the sugar, salt, flour, and cinnamon. Add the melted butter, stirring until well combined. Set the topping to the side. Pour/spread half the batter (a scant 3 cups) into the prepared pan(s), spreading all the way to the edges. If you're using two 9" round pans, spread 1 1/3 cups batter in each pan. Spread the remaining batter atop the filling. Use a table knife to gently swirl the filling into the batter, as though you were making a marble cake. Don't combine filling and batter thoroughly; just swirl the filling through the batter. Note that the cocoa powder is used strictly for color, not flavor; leave it out if you like. This is my absolute favorite kind of coffee-cake! Gorgeous swirl and lots of streusel, yum yum yum! Thanks Kayle! It honestly is the best coffeecake recipe EVER! Love that thick layer of streusel! Wish I had a slice to go with my coffee! Thanks Jessica! It is so so good! HI. Having trouble printing. Just takes me to an add for Buick. Hi Patti, thank you so much for letting me know. I’ll contact my webmaster to help! Do you think this could be cut in half and made in an 8″ or 9″ square pan? Hi Mary Jo, you could bake it in two 8×8 or 9×9 pans! I’ve done it! But I’m not sure how to cut the full recipe in half! Gift some to a neighbor for the holidays!